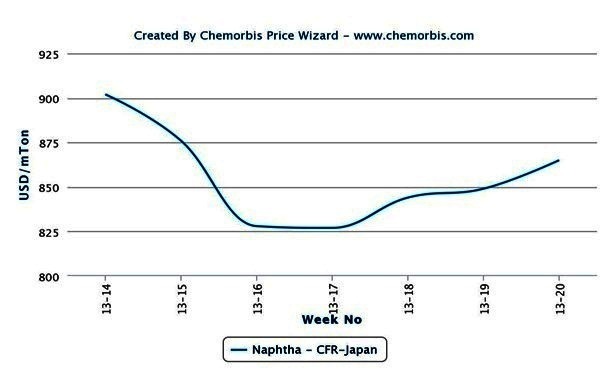 In Asia, spot monomer markets soared week over week mainly triggered by firmer crude oil prices since May started as per the pricing service of ChemOrbis. Although energy costs recorded some losses in the second part of last week, they still showed a slight gain on the week and stood above early May levels which drove spot naphtha prices higher during the period, which was another factor behind higher monomer markets.Crude oil prices on the NYMEX edged up less than a $1/barrel for June delivery cargos during the past week amidst some drops during the second half of the week. However, they still indicated an increase of $5/barrel with respect to the beginning of May. 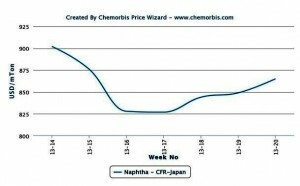 The rebound in the energy complex pushed spot naphtha costs up by $40/ton on CFR Japan basis on the week to represent a $10/ton increase when compared to early May.In the ethylene market, spot offers represented a $25/ton increase on CFR Northeast Asia basis after holding steady on Monday on the back of the higher upstream chain. Buying interest picked up some amidst the firmer stance of sellers in the downstream markets, according to market players in the region. 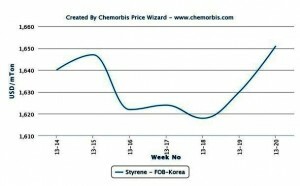 Spot propylene prices inched up $5/ton at the beginning of this week from last Friday on FOB South Korea basis while they represented a $15/ton increase week over week. Apart from firmer crude oil and naphtha prices, expected supply constraints formed another reason behind a stronger propylene market. According to some market sources, a Japanese company, Nippon Shokubai may resume operations at their acrylic acid plant in the country by later this month which could reduce propylene supplies from Japan although an exact date for the restart was not disclosed. According to ChemOrbis, in the styrene market, spot values posted larger increases on FOB South Korea basis with respect to the gains for ethylene and propylene. Offers rose by $20/ton on Monday on a daily basis bringing the total gain to $50/ton in a weekly comparison. Spot styrene availability was said to be lower in China, according to sources, which strengthened the market for the monomer.